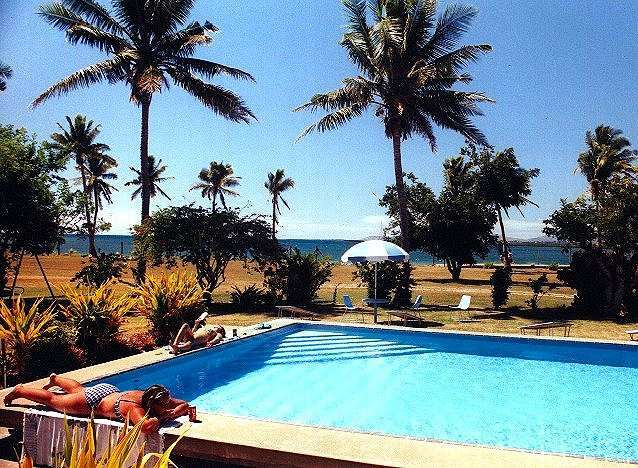 A peaceful and secluded retreat for the independent traveller, SAWENI BEACH APARTMENT HOTEL is located on the only white sand beach in the Nadi/Lautoka area. 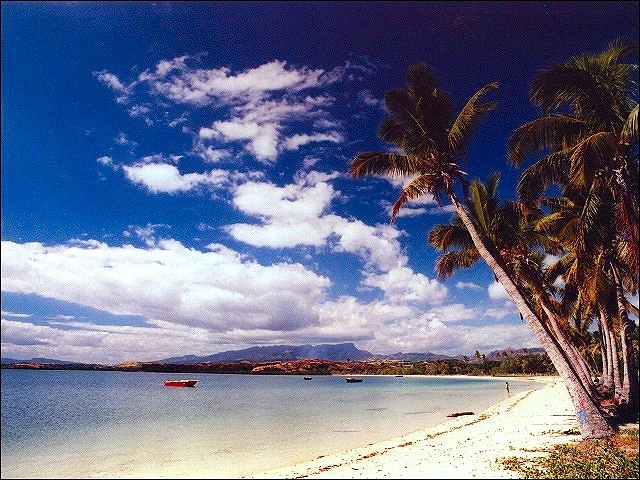 The perfect place to get away from it all, Saweni Beach was the staging area for the ocean-kayaking leg of the 2002 ECO-CHALLENGE FIJI expedition race. Travellers looking for an alternative to staying in Nadi may prefer to spend their first or last nights at Saweni instead. Please note that due to Saweni's secluded and quiet location, this property is not recommended for people looking for a party scene. Saweni offers a choice of self-contained air-conditioned or fan-cooled apartments, all with modern kitchens and regular maid service. All apartments are bright, clean and spacious, and offer quality accommodations at very reasonable rates. Travellers on a budget may prefer our bright and spacious 8 bed dormitory (see below for more details). 12 self-contained 1-bedroom apartments (either fan-cooled or with air-conditioned bedrooms), each with ceiling fans and insect screens, large separate bedroom with queen-sized or twin-beds (that can be joined together), lounge and dining area, kitchen with gas stove, refrigerator and utensils, private bathroom with solar hot water, and spacious verandah. Linen and maid service are provided. Our modern and spacious dormitory offers a total of 8 beds in 2 rooms, plus an open-plan kitchen and living area, and a communal bathroom with solar hot water. Bed linens and maid service are included. 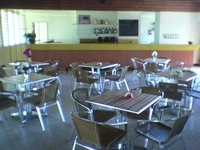 MEALS: All apartments have kitchens and cooking facilities for self-catering. Most guests find it convenient to stock up on groceries in Nadi town before coming to Saweni to check in, as supermarkets near the airport are usually open quite late. Alternatively, Lautoka town (about a 15 minute drive/taxi ride from Saweni) is Fiji's second largest city and has large supermarkets and markets for fresh fruits/vegetables. Abaca eco-tourism trek  highland villages, waterfalls, native rainforests, etc. Active Adventures  including jet-boating and sky diving! Day Cruises and Island Day Trips  a range of day trips are available, to suit those seeking an active adventure or those looking for an uninhabited getaway. Cultural and Nature Tours  includes the famous Waterfall and Cave tours and other village visits for an authentic Fiji experience. 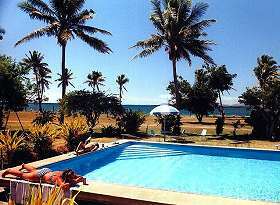 GROUPS and SPECIAL EVENTS: Saweni Beach Apartment Hotel may be booked in its entirety for groups wishing to hold affordable retreats or special events. We have hosted a range of groups, including sporting teams and camps, corporate retreats, training and educational seminars, Camp Quality (for children living with cancer), religious and spiritual gatherings, family reunions, and more. Please contact us for more information on group rates and how we can be of assistance. 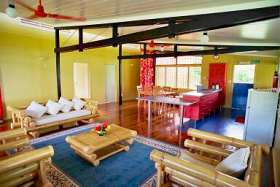 The Saweni Beach House is a spacious and modern timber beach house with polished wood floors and a long verandah, set well away from the main complex for maximum privacy but with full use of all hotel facilities. 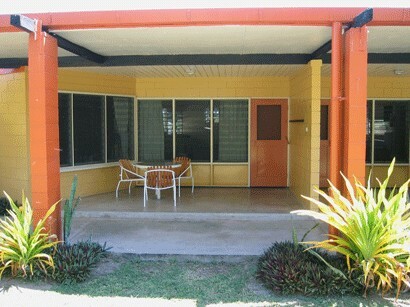 There are 4 air-conditioned bedrooms in total: 2 rooms have ensuite bathrooms, and 2 rooms share a bathroom. There is an open plan living/dining room (with ceiling fans) and an open plan kitchen. The Beach House sleeps 1-8 people, and is available for minimum stays of 3 nights or more. Please note that the Beach House is available for individual vacation rentals only, and cannot be booked as part of a group booking or as a venue for parties or meetings. For more information including photos and reservation procedures, please visit the Saweni Beach House website. NOTE: At the owner's request, this is a strictly non-smoking house. Travel Agents: Please enquire about our commissionable rates. Reception Hours: Our reception desk is open 7 am to 10 pm daily. and closed overnight. After hours check-ins are available for guests with confirmed bookings only; the security guard will have your key ready for you and check-in formalities may be completed the next morning. IMPORTANT: Apartment rates are per apartment based on 1 or 2 people, and there are additional charges for 3rd or 4th guests in apartments. Maximum occupancy 4 people per apartment. Dormitory rates are per person. Reservations: Advance bookings for Saweni can be made using our Reservation Form which will come to a "live" person during office hours who will respond and assist you personally within 1-2 working days. This is the only way to make group bookings, bookings for more than 1 apartment, bookings for 6 or more nights, and bookings for the Saweni Beach House. Walk-in bookings are also most welcome on a space available basis should you not wish to make an advance reservation. If you are driving, call for directions or look for the sign on the side of the Highway, otherwise most taxi drivers are familiar with the area. Alternatively, public buses run from Nadi Airport to Lautoka city, and then there are buses from Lautoka city to Saweni Beach. Assistance at Nadi Airport  IMPORTANT: Since the closure of the Fiji Visitors Bureau at Nadi Airport, there is no impartial, official or government-sponsored visitors office at the airport. Please be aware that the only "information" now available at Nadi Airport is from commercial travel agencies who receive commissions for any bookings they perform. Airport Touts  There are a number of travel agents and touts operating from Nadi Airport who make a living out of "poaching" pre-booked clients from other hotels by attempting to divert unsuspecting travellers to alternative accommodation at properties that pay them high rates of commission. Please be aware that if you have a confirmed reservation at Saweni or any other property and you decide on the advice of these touts to either not show up at your prebooked accommodation or to cancel at the last minute, that you will be charged a no-show or last minute cancellation fee. Despite anything that the touts might say to the contrary, they do not have the ability to waive no-show or cancellation fees that may be charged by the hotels at which you have made a confirmed booking. If you experience any problems with airport agents or touts, please send us a note and we will take the matter up on your behalf. To Make a Booking, please use the Reservation Form for personal service by one of our reservations staff (may take 1-2 working days) or if you are already in Fiji, please call us at our central reservation line (679) 330 8644 (Mon-Fri 9am-5pm) or the hotel directly at (679) 666 1777 to make a reservation by telephone. Alternatively, walk-in bookings (no reservation) are most welcome on a space-available basis. Book direct and save on your accommodation! SPECIAL OFFER: Book and prepay a 7 night stay and receive a 10% DISCOUNT off your accommodation! Conditions apply, and the discount is not available during the Holiday Season period of Dec 22-Jan 2. Email us at saweni@fiji4less·com and ask about the 7 Night+ Discount at Saweni.